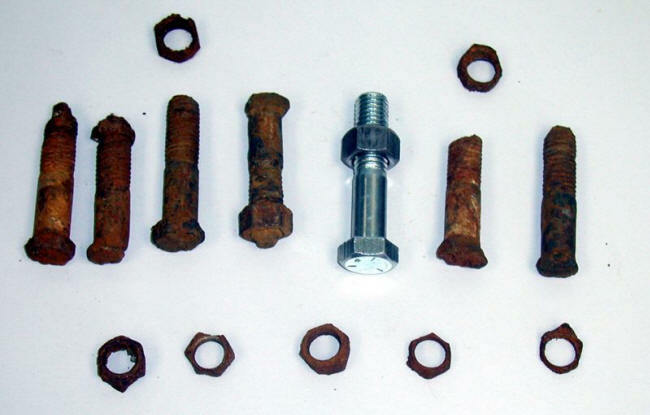 If an ordinary nail is dropped into a vessel of salt water, it will be attacked, and, after some time, rust will be observed discoloring the water. The initial points of attack will be, in almost every case, the point and the head. This is an example of a type of cell known as a stress cell. The following Figure shows how dramatic this effect can be on the heads and nuts used to hold fire hydrants on their base in the soil. In these cases the two electrodes are of the same metal and the electrolyte is uniform. The difference lies in that one electrode is more mechanically stressed than the other. The area of high stress is always the anode of the cell, made that way by the extra energy supplied by the stress itself. Stress cells can take on two basic forms. One, like the nail just described, has its anode established by residual internal stress or stress left because of something which has happened to the metal. In the case of the nail, the stress was caused by cold-forming of the head and point. If these stresses had been relieved by heating the nail at a moderate temperature and letting it cool slowly, the stresses will disappear and this type of stress cell will be eliminated. In the other type of stress cell, the metal is part of some kind of structure which is under stress. The most highly stressed part of the metal becomes the anode, with the less stressed or unstressed metal acting as the cathode. For carbon steels this temperature would be 75-80ºC below the A1 transformation temperature, which is about 727ºC. Therefore stress relieving is done at approximately 650ºC for about one hour or until the whole part reaches the temperature.